This is the second week that I’ve started off with a dessert recipe, but during Winter, sometimes that’s all you need. And this being my birthday week, it’s even more justified. 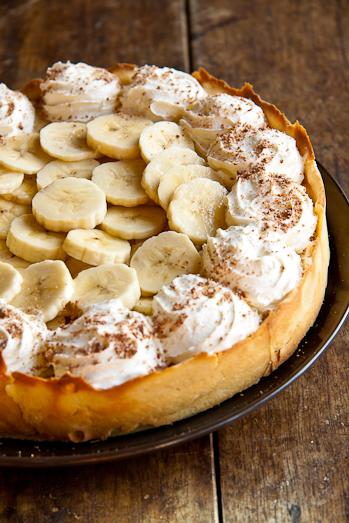 Banana Cream Pie is something I’ve been dying to try. As I’ve mentioned before, I have quite a fascination with American food and I’ve ventured into it just slightly. We only recently got The Food Network in South Africa and I’ve been kind of hooked on some of those shows. Some, I don’t care for as much but The Barefoot Contessa (Ina Garten – I love you!) and Diners, Drive-ins and Dives have been two of my favourites. DDD is one of those shows that can both surprise me and shock me during the same episode. I am always surprised at the cooks/chefs who, in the back of a tiny little diner makes their own stock, pasta and breads. I am always shocked at the amount of butter and gravy used. But it takes a lot to put me off and so far I haven’t been. I’d to visit the States and I’d love to explore all those diners and ESPECIALLY the BBQ joints. Just thinking of those ribs makes me salivate slightly. That’s why I decided to try (what I believe to be) an All-American Favourite, Banana Cream Pie. It was on one of the DDD’s that I saw a lady making Banana Cream Pie and I fell inlove. I really like banana in desserts and Banoffee Pie is one of my all time favourites, so I just needed to try the American version. 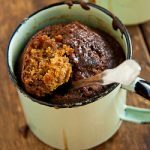 An easier dessert you won’t easily find and it can be made easier by using cookie crumbs as the base instead of pastry (I used a shop-bought short-crust pastry). The filling is made on the stove and takes all of 10 minutes before it can be put in the fridge to cool down. 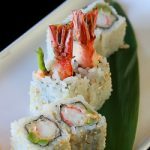 I loved this recipe so much, I made it twice in the last week and both times my family just loved it. For an updated version of this recipe, Click HERE. Beautiful! What was your technique for getting the crust to look like that? It seems like you used a spring pan. Did you do the sides and bottom separately and just pinch them together? Or did you lay your whole crust down in the pan and smoosh it upwards? I have got to try making my pie crusts look like this, so pretty and unique! Michelle, I use a quiche dish/tart pan with an edge like that and it is indeed a springform pan. I laid the whole crust down in the pan and then pushed it into the edges. Sarah that is VERY strange. Usually if it’s thick on the stove it will set even more in the fridge. For it to turn to liquid is very bizarre and I’ve never had this complaint before. I’m so sorry, I wish I could be of more help! The outcome is that this crust does not represent the picture that you see. Just made it and the crust is crumbly and if your looking to slice it use a spoon! Seems more like a pudding than a pie. Taste good. I may use a different crust next time or do something to make the current crust hard so it will slice up like a pie! CIndy, in the post I mentioned that I used a shop-bought shortcrust pastry for the crust but you can also use the cookies that I listed in the ingredient list. In the UK this is called Banoffee Pie. It’s pretty much the same except the base would usually be made of crumbled digestive biscuits just like a cheesecake base. Might be a silly question but do you use sweetened or unsweetened condensed milk? Amber, I use sweetened condensed milk. Unsweetened will result in you having to add extra sugar so it simplifies the recipe a bit. My (American) husband requested banana cream pie for his birthday. I will definitely be using the filling part of this recipe. I was wondering what kind of crust was used for the pie in the pictures. It is a baked crust which a texture you would not be able to get with ground up cookies. I have two questions, what kind of cream and how much is a tin of condensed milk, a small can? Can’t wait to try it! You can use normal pouring cream and I think a normal condensed milk can is about 400g if I don’t have it wrong? As in heavy cream or whipping cream? Beautiful pie, and once I figured out what “tennis biscuits” were, lovely recipe. I was trying to figure out how you got the sides to stand up like that… and noticed you tagged the post as “banana tart”, and realized you probably used a tart pan or springform pan to get that look. In case anyone else was curious! Thank you! I made it this morning and it was sooo good!! I couldn’t find tennis biscuits (not sure if they are available in the US), but I substituted them with coconut cookies that I found. I crumbled them and mixed with a bit of melted butter like you would for a graham cracker crust, and baked it slightly before adding the banana mixture. Absolutely delicious! Lelly, so glad you enjoyed it. What size tin for the condensed milk? I would like to make this for an upcoming family get together. My husband loves banana cream pie. Kelly, in SA we have 385g tins and that’s the one I use. 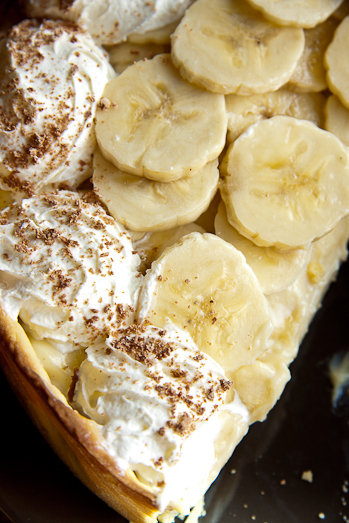 This has got to be the best looking Banana Cream Pie I’ve ever seen and I bet it tastes even better. It looks so delicious! I did it. It is yum. 1) What are tennis biscuits? 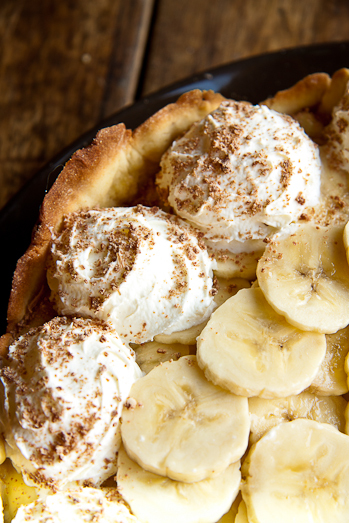 I’m an American, and this is the nicest looking banana cream pie I have seen in quite some time, and I have a few banana’s I need to use soon. Zoe, tennis biscuits are a South African coconut flavoured cookie. But I’m sure graham crackers will work just as well. Cornflour is corn starch. I’m not sure what else they would call it in the US? In the US it us called cornstarch. First of all. Corn flour and cornstarch are two totally different things. I just made this recipe and had to add flour because the mixture wouldn’t thicken. Stirred 45 minutes and nada. We finally had to add flour to the mixture and stir another 20 minutes before it thickened a little. I’m really hoping this pie turns out, if not I guess we will be having lamb for dessert. Nikki, so sorry your custard didn’t thicken but corn starch and cornflour are the same (http://en.wikipedia.org/wiki/Corn_starch). A lot of things could’ve happened to your custard. Altitude, moisture in the air and even the brand of corn starch/flour all play a role. I’ve never needed to add flour to my custard but if you wanted to try this again, perhaps use more cornflour instead of regular flour. I hope your pie turned out! http://simply-delicious-food.com/2010/11/25/maple-and-pecan-stuffed-coffee-cake-and-a-book-giveaway/ There’s the link Revaan. The recipe calls for 200g caster sugar. your photo is amazing! I’m salivating at my desk! You are so lucky to have the Food Network there! Im an American living in The Netherlands and I don’t have it 🙁 I miss it so much..lol Banana Cream pie is a total favorite for sure..lemon meringue pie is another,coconut cream pie,strawberry rhubarb pie,the list is endless really..lol This looks fantastic! yup i live in the US and it is definitely a favorite… you have to try banana pudding next!!! not the kind with the pudding mix though, the recipe with the baked meringue on top! i bet if you googled vanilla wafer banana pudding recipe it would come up! Most Americans would actually make this with a banana flavoured pudding mix. The restaurant I worked in when I was in high school used to put a layer of bananas on the bottom and top. Also, you should try Ina Garten’s lemon bars. This looks awesome! Have you made a Banoffee Pie before? I’ve been coming accross it a lot recently and can’t wait to try it! Tess : I’ve made a cheat’s version, but not the real thing. It is delicious! Pink Polka Dot : Indeed! Reney : I’m not too fond of pre-made mixes but I did see it being used in a lot of the recipes I came across. Caitlin : Good to know that it really IS a favourite there. You always hear these things but can never be sure, you know? Yum! – I love banana’s so much.